In accordance with President Obama’s National Climate Action Plan, the U.S. Environmental Protection Agency (EPA) is proposing to expand the list of refrigerants to include alternatives that are more climate-friendly and do not harm the ozone layer. Incorporating input and feedback from industry, environmental groups and others, the EPA, through its Significant New Alternatives Policy (SNAP) Program, is proposing to list additional low Global Warming Potential (GWP) refrigerants across six refrigeration and air conditioning applications. 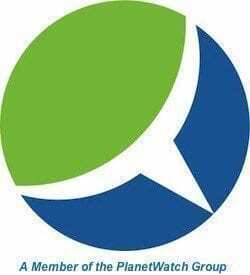 The use of ozone depleting substances is being phased out worldwide in accordance with international treaty: the United Nations (UN) Montreal Protocol on Substances that Deplete the Ozone Layer, which went into effect in its original form on January 1, 1989. Following a similar path, growing concerns about the damages and threats posed by emissions of greenhouse gases (GHGs) and a warming climate have prompted the U.S. and other governments to search for refrigerants that don’t deplete the ozone layer – which shields all life on Earth from harmful ultraviolet radiation from the sun – and have lower global warming potential (GWP). Established under the 1990 Clean Air Act (CAA), the EPA’s SNAP Program assesses chemicals and technologies that don’t harm the ozone layer. The EPA is now proposing to amend the list of ozone-friendly refrigerants to include refrigerants with low GWP used in stand-alone commercial and household refrigerators and freezers; very low temperature refrigeration; non-mechanical heat transfer; vending machines; and room air conditioning units. 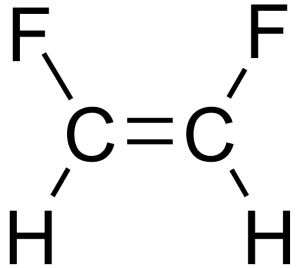 Also being proposed is HFC-32 or R-32 (difluoromethane), a refrigerant with zero ozone depletion and just one-third the GWP of conventional refrigerants now being used in air conditioning units. Many of these proposed refrigerants are already used for these purposes in Europe and Asia, according to the EPA. The EPA’s proposal is open for public comment for 60 days upon its publication in the Federal Register. In accordance with the Montreal Protocol and CAA, the National Oceanic & Atmospheric Administration’s (NOAA) Earth Systems Laboratory measures and monitors stratospheric ozone and ozone-depleting substances in two different regions: the Antarctic and at mid-latitude. 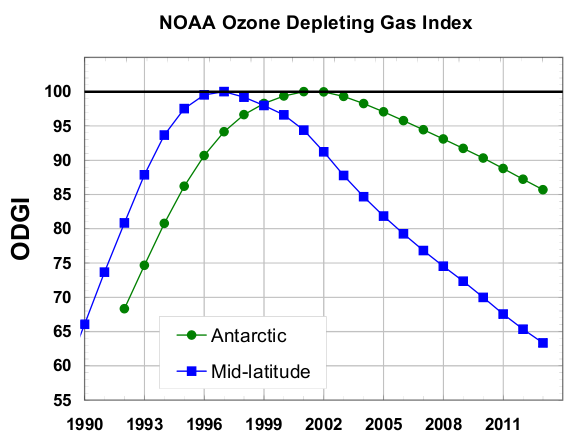 The NOAA Ozone Depleting Gas Index-A (ODGI-A) registered a level of 85.7 in 2013. That’s a 14 percent reduction in the abundance of halogens from its 1980 peak in Antarctica (ODGI=100). The goal of the Montreal Protocol is to reduce that to its 1980 benchmark level of zero. Full recovery of the ozone layer in the mid-latitude stratosphere is expected when the ODGI-ML (Mid-Latitude) reverts back to zero, its 1980 benchmark level. The ODGI-ML stood at 63.3 at the beginning of 2013.